In light of the recent resignation of Homeland Security Secretary Kirstjen Nielsen, a saying from former Defense Secretary Donald Rumsfeld and former British Prime Minister Winston Churchill comes to mind. When serving a president in a cabinet position, Rumseld said, "be able to resign, you’ll do the president and yourself a favor." Churchill claimed the word “try” is the most overrated word in the English language. At some point, Churchill said, you have to succeed at what you're doing. In other words, trying isn’t enough. Only results matter. These two philosophies are essential tenets of leadership. When you serve an executive, you better keep both of these sayings in mind every day. Your job is to carry out the vision, directives and policies of the executive. If you can’t, you should have the courage to go to the executive, inform him or her of such and offer your resignation or prepare yourself to be fired. These words fired and resigned sometimes are synonymous as in the case of Nielsen. Another job requirement for a leader who serves an executive is to keep the heat off the executive and absorb it onto you. Nielsen did neither. One way is to make it clear you are on the same page as the commander in chief by understanding the president’s objectives. In a speech delivered this past March to DHS personnel, Nielsen listed cyber threats as her highest priority. That is not what I heard President Trump say about domestic security. A flood of news headlines recently focused on the failure at the border as illegal drugs are pouring into the country despite the best efforts of border patrol and immigration agents. The agents are overwhelmed, like trying to drink from a fire hose. Congress's inaction to fix the humanitarian crisis at the border coupled with the lack of resources including more border patrol and immigration agents, added facilities to detain illegals on arrival, and additional immigration judges to more quickly hear and dispose of these asylum claims and immediately deport those who should be kicked out, are an explosive combination. In an interview last week a former border patrol agent said the U.S. is not making any progress combating the flow of narcotics through its southern border. He said that while there is the occasional seizure, it pales in comparison to the amount of drugs that slip by. Let that sink in. A recent news headline read: "Trump’s DHS releases more than 17K illegal aliens into the U.S. in 12 days." I am sure these are not headlines the president wants to wake up to and read. Trump made it clear in his State of the Union address to the nation that the days of catch-and-release are over. It was Nielsen’s job to execute that policy. She failed. Whether she was between a rock and a hard place is irrelevant. Her job, as Churchill had famously said was to succeed, not merely try. I questioned the tactics used by Nielsen in dealing with the surge at the border when she announced last week that she was moving 750 border agents to border checkpoints. My first thought was, really? Where was she taking the agents from? Their ranks are already depleted. That sounded good to the media, but to me, it was like moving deck chairs around on the Titanic. Another reason I questioned this tactic is because I recently visited the southern border at the Rio Grande Valley sector and the Big Bend sector both at the Texas border and saw the situation up close. One Border Patrol station that five years ago had 92 agents today is depleted to a mere 19 agents doing the work that five times that many were previously doing. Nielsen was aware of the lack of resources. Why didn’t she go to Capitol Hill and continually beat the drum for not having enough agents or issue weekly news releases to that effect? Another reason I questioned Nielsen’s tactic is because it plays right into the hands of the drug cartels along our southern border. Mexico is a failed narco state whose northern border is controlled by the many drug cartels. One of their strategies is to use the caravans from Guatemala and Honduras to overwhelm a U.S. checkpoint necessitating an increase in agents from other areas to facilitate the surge. The agents are reflexively taken from already depleted ranks along the border leaving border areas open and vulnerable. Dangerous drugs and human smugglers then use those un-patrolled areas to border cross. In this game of cat and mouse, Nielsen’s tactic was a bandaid over a gaping wound. President Trump is doing all the heavy lifting on border security. He’s getting very little help from both parties in Congress. He needs a staff that clearly understands and fully supports his policies and directives. No more catch-and-release means precisely that. 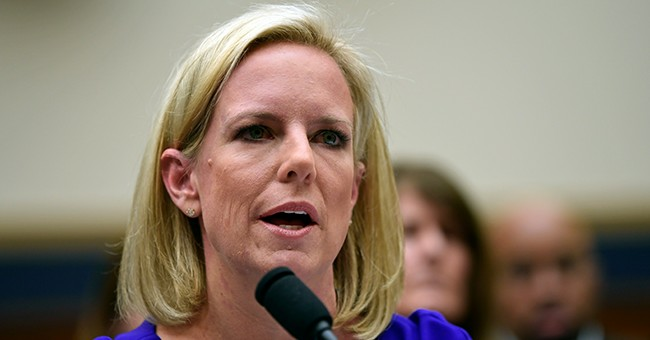 Nielsen began many of her responses to border security by telling us what she can’t do. Can’t has been described as an acronym for: Common Among Negative Thinkers. In other words, “can’t” wasn’t succeeding and therefore resigning, or the polite way in Washington D. C. of being fired, was the best option for herself and President Trump. Trump deserves a Cabinet with people who possess a can-do attitude. America deserves it too.